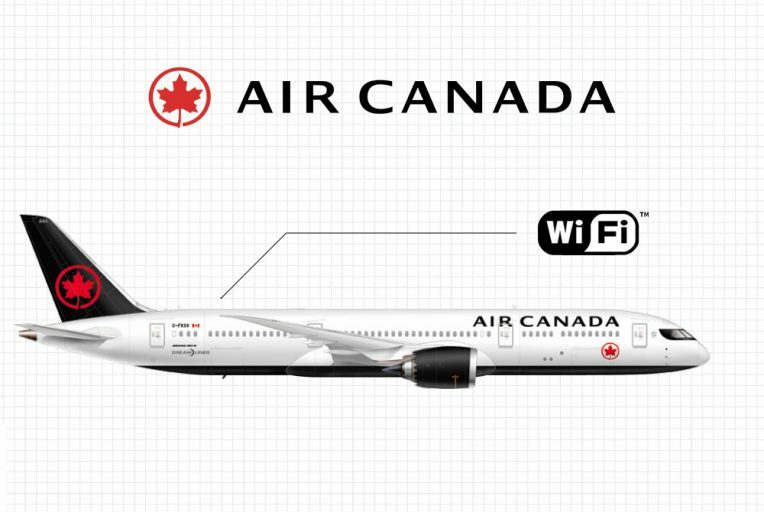 Az Air Canada internetezési lehetőséget biztosít amerikai járatain. Az amerikai (Kanada, USA, Mexikó) felett internetezésre van lehetőség, az over-seas járatoknál pedig az entertainment system megy wifi-n keresztül: a Rouge típusú járatán (ami Budapest-Toronto között is közlekedik) nincs monitor vagy a szék hátuljába épített kijelző, hanem mindneki maga a laptopján, tabletjén vagy mobiltelfonján tudja nézni a filmeket, hallgathatja a zenét – és lássuk be, manapság mindenki visz magával valamilyen eszközt az utazáshoz, így ez teljesen rendben van. Use any Wi-Fi enabled device to get online with Gogo for 30 continuous minutes during this flight segment. Access to Gogo for 30 continuous minutes during this flight segment. The Gogo 30-Minute Pass price is specific to this flight segment. 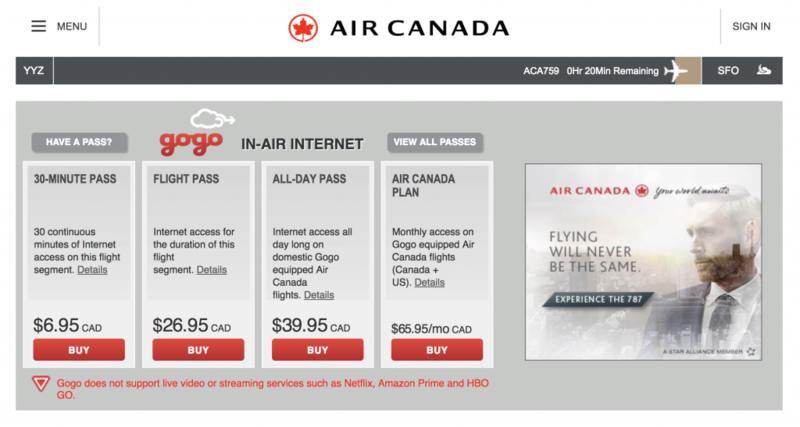 To complete your purchase, you will need to sign in to your Gogo account. If you don’t have a Gogo account, you will be prompted to create one. Once you complete your purchase, you are free to connect. If you have a promotional code, you can enter it prior to submitting your credit card information. Taxes may apply, where applicable. A Gogo 30-Minute Pass can be purchased at any time while the aircraft is in flight, once the use of electronic devices is permitted or the aircraft ascends above service altitude, whichever comes later. Your Gogo 30-Minute Pass will expire 30 minutes after your initial login, and will allow you to sign out and sign back in any time during that 30 minute period, on the same device or a different device, without the need to purchase another Gogo pass, but will not allow access to Gogo on more than one device simultaneously. After takeoff, you can use Gogo once the use of electric devices is permitted or the aircraft ascends above service altitude, whichever comes later. Compatible with most virtual private network (VPN) software. Gogo will become unavailable as the aircraft makes its final approach to its destination and prepares for landing, so please save your work! You will have access to Gogo customer care via eChat live messaging. Like any mobile broadband network, connectivity speed may vary due to your device, atmospheric conditions, terrain, network capacity, and aircraft location. In order to preserve an equitable passenger experience for everyone, Gogo prioritizes different types of usage. Some content, file sharing or gaming requiring high bandwidth, such as streaming audio and video, is given a lower priority and at times may not work consistently or at all. Your airline may also have policies that would restrict some uses.